The Sixty Best Episodes of XENA: WARRIOR PRINCESS (46-50) | THAT'S ENTERTAINMENT! Happy Independence Day and welcome to another Xena Thursday! We’re continuing with my 60 favorite episodes of Xena: Warrior Princess. I’ve been a fan of this series since I was about three years old and believe me–this list was tough to make! If you’re unfamiliar with the show, it was a spin-off of Hercules: The Legendary Journeys and aired in first-run syndication from 1995 to 2001. Taking place primarily in Ancient Greece, the show focused on Xena (Lucy Lawless), a reformed warlord seeking redemption for her evil past by helping others. She traveled with her best friend, Gabrielle (Renée O’Connor), an aspiring bard and the chronicler of Xena’s adventures. With all that said, let us resume with episodes 46-50 on the list. This episode was promoted as a sequel-of-sorts to the previous season’s “A Day In The Life.” The only real similarity is that it’s a comedy and fish are involved. The plot is very silly. Aphrodite steals the North Star and to stop Xena, Gab, and Joxer from retrieving it, she casts spells on them so that they become obsessed with whatever they are presently viewing. Joxer is looking at a picture of “the ape man” so he runs around acting like an ape. Gabrielle is looking in the mirror and becomes obsessed with herself and her beauty. Xena is looking at fish and decides that the only way to recapture the North Star is to go fishing. This episode has always been a personal favorite of mine, and it’s one of the zaniest comedies that the series ever produced. However, it’s one of the most successful, I think, because it draws upon previously developed character traits and exaggerates them. Originally Gabrielle was going to become obsessed with Xena, but a few days before production, the network demanded a rewrite. (I think this actually works better with Gab obsessed with herself.) Very funny, but probably not a good starting place for first time viewers. This was the first comedic episode of the final season and the first entirely successful comedy since Season Four. Xena, Gabrielle, and Ares go back to her childhood home and disguise themselves as farmers. The late Kevin Smith as Ares gets the most to do, and there’s not a lot of action. The fourth act fight is only a short mock one that Xena and Gabrielle put on to trick the warlord into going in the opposite direction. It’s very funny. Fortunately, the episode is so entertainingly crafted that the lack of action is hardly noticed. On the romance front, there are moments here that should satisfy both Xena/Ares fans and Xena/Gab fans alike. A small subplot involves Xena’s pursuit to capture her youth and the happy times she shared on the farm. My favorite moment occurs between Gabrielle and Ares when she asks him why he gave up his immortality to save her and Eve. Renée is also dynamite pretending to be the slutty farm girl. In short, there are lots of great moments in this feel-good episode. This episode changes the entire series. The show opens with an elderly Joxer purchasing Gabrielle’s last scroll and reading it to his kids. In it, Xena and Gabrielle learn from the Fates that the only way to bring about the Twilight of the Gods (end of the Olympian order) is for Xena to die. SPOILER ALERT: The episode ends with Xena and Gabrielle faking their own deaths in front of the Gods and a grieving Ares entombing them in a cave of ice. Meanwhile, Xena’s daughter Eve, goes off with Octavian, a Roman general. (The next episode opens 25 years later with Xena and Gabrielle waking up.) While it was sad to see all the other characters age, it was an INGENIOUS way to get rid of the baby and have Eve as an adult. My favorite moment in this episode, and maybe of the entire season, occurs when Xena kidnaps Hades’s sister, Celesta, the goddess of Death, whom we met in Season One, and confronts her about all of the lives she’s taken – Solan, Marcus, Lyceus – without ever knowing what true loss is. It’s a very powerful and very real moment. Najara returns claiming a newfound mantra for nonviolence while Joxer wrestles with the guilt of his first kill. Najara, one of the series’s best villains, returns in her second and final episode. Many fans, who loved her first appearance, thought this episode ruined the character by having her go insane in the fourth act. To that, I have two things to say. First of all, she hears voices. She was never not crazy! Second of all, the show had to end with a fight between Xena and Najara, and it wasn’t unmotivated that she would suddenly go cuckoo. She was always cuckoo! That issue put aside, the rest of the episode is very gripping. 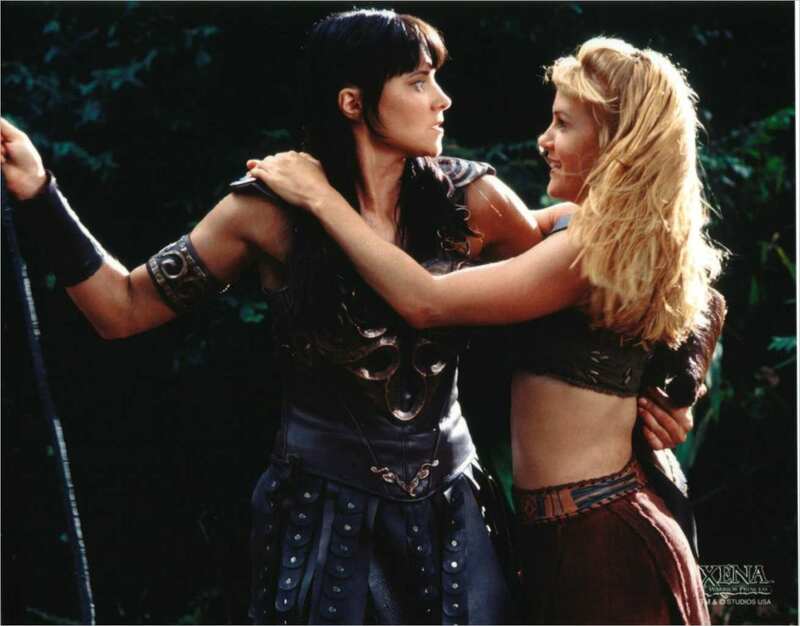 First, the conflict between Xena and Gabrielle, as Gabrielle believes that Najara has converted to non-violence, perfectly highlights the differences in their characters and their current paths. But the best part of the episode has Joxer dealing with his first kill. Joxer, almost always a comic relief character, is actually developed in this episode and it is so great to watch. This is a fascinating and underrated episode. Najara wasn’t as strong as she was in her first episode; so what? Her descent into madness wasn’t unmotivated. Xena was right. Cuckoo! This is one of only a few times that the series’s two best writers are credited as having directly collaborated in writing a script. From the first season, this is an action packed episode. 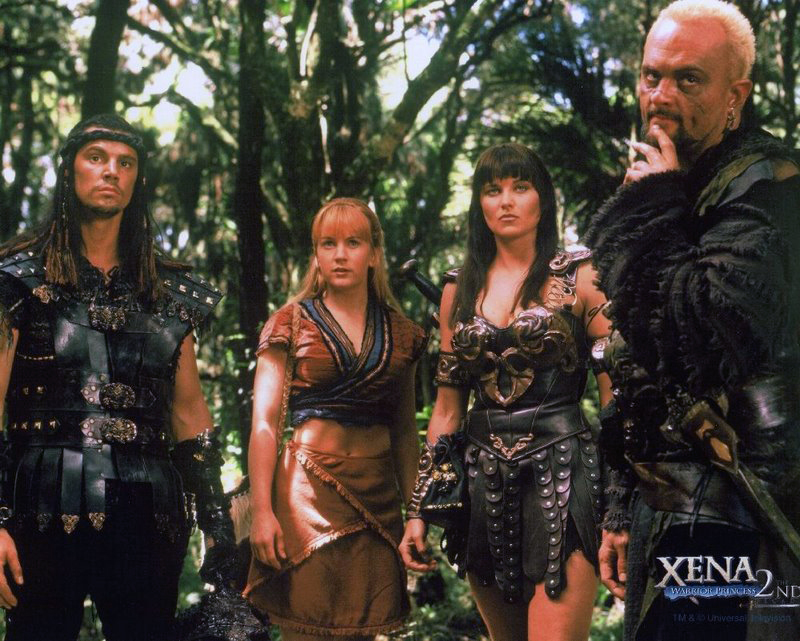 Xena and Gabrielle team up with two killers to find the Sumerian treasure. The real reason behind the quest is to stop Ambrosia, the food of the Gods, from falling into the wrong hands. But the more personal story in this episode involves one of the killers, who happened to be Xena’s former fiance. He left her at the altar, and she is, well, still bitter. To make matters worse, he and Gabrielle seem to be falling for each other. My favorite part of the episode is the tense opening sequence that sets up the tone. This is Xena, not Hercules. More people die in a Xena teaser than in half-a-season of Hercules. By now, the series understands that and is fully committed to its style. This is one of the fastest moving episodes of the season and the heightened pace is greatly appreciated. Possibly a good place to start for new fans. Come back next Thursday for numbers 41-45! And check back tomorrow for another Film Friday post! Pingback: THE XENA SCROLLS: An Opinionated Episode Guide (113 & 114) | THAT'S ENTERTAINMENT! Pingback: THE XENA SCROLLS: An Opinionated Episode Guide (519 & 520) | THAT'S ENTERTAINMENT!